Katie McGarry has created a pattern of steamy hot, fun bad girl/good guy (or bad guy/good girl) romances over the course of three books. She established a close friendship between three troubled teens in her first novel Pushing the Limits - Noah, Beth, and Isaiah. Each has been the star of his or her own novel and found the love of that character's life. It's Isaiah's turn for happiness in Crash Into You. He's reeling from the loss of Beth, who he'd been in love with for years. Unfortunately, their relationship was only a one way street. Isaiah meets Rachel when both of them do something stupid with dire consequences. Isaiah's reason for illegally drag racing is financial desperation. Rachel's reason was naivete. Even though what they've done is technically wrong, the reader is quickly sympathetic to the characters and their plights. Isaiah is a character that I've neither liked nor disliked in prior books. I quickly grew to care for him in this book, similarly to how I came to love Noah and Beth. With his tattoos and stand-offish demeanor, Isaiah looks like a tough dude. And he is. Life has been brutal and he's learned street smarts to survive. I like that Katie never succumbed to the tough guy on the outside, softie on the inside trope. Even after Rachel comes into his life, he maintains an edge. Isaiah is loyal, practical, and smart. He's great with cars and has potential of making a good career out of it. I was not as much a fan of Rachel. She's very white bread. A nice girl. I wouldn't even use the term "interesting." Rachel was born as a replacement daughter for Colleen, who died of cancer. She's coddled by a mother who wants her to be the frilly daughter she lost and four overprotective brothers. Rachel feels like she has to hide herself. For one thing, she'd much rather be driving or fixing cars than shopping. And also, that she gets horrible panic attacks when she has to speak in public or do other stressful things. Rachel's panic attacks are portrayed as something that would devastate her mother if she knew they were still going on. I found that hard to understand. Why would panic attacks be such a horrible secret? I get that panic attacks are a serious medical condition. But it's not like she has cancer. And her family are massive jerks for ignoring Rachel's health by shaming her into silence. In many ways, the Isaiah and Rachel pairing works. They have a mutual interest in cars. They both come from troubled families, albeit in different ways. They were thrust together in high tension situation that forces immediate closeness. In other ways, it doesn't work so well. I felt like we were being told that they loved each other by steamy make-out scenes and professions of adoration. Neither of those things are bad per se, but I consistently felt like I was being hit over the head with it. Also - an admittedly superficial complaint - I hated that Isaiah called her "angel" all the time. I don't like terms of endearment and "angel" ranks up there with "love" in terms of my gag tolerance. The strongest part of Crash Into You were the side characters. Noah, Echo, Beth, and Ryan play small but pleasant roles. I loved Courtney, Isaiah's persistent, caring social worker. I like how each of the PTL books have one strong adult influence. I adored Isaiah's drug dealing friend Abby who makes a new friend in Rachel. I did have to suspend disbelief somewhat, but I didn't care. I also loved Logan, Beth and Ryan's daredevil friend. He and Isaiah were made for each other. 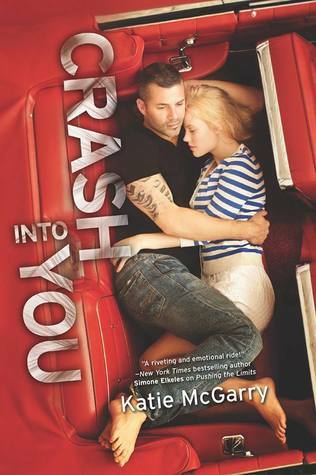 While I have more problems with Crash Into You than I did with the wonderful Dare You To (the second book in the PTL series), I still enjoyed it and think it's a worthy read. I particularly loved the ending. It went in a dramatic direction that I didn't expect and then came to a good conclusion. In fact, that was my favorite part of the story. If you're looking for a textbook fun romance, you can't go wrong with Katie McGarry, no matter what. I definitely enjoyed this one. There was an awful lot of sighing and long, passionate moments, though. Not that I'm complaining about passion but, well, yanno. Even though you had more complaints with this one than you had with the other books, I'm still so impressed with how well this series is received! They are not my usual kind of read AT ALL, but I frequently find myself close to caving and reading them all. But ugh, I'm no fan of terms of endearment like "angel" either! I'm thinking I'm going to love this one. I have been reading all of the books as the come out and have enjoyed them all. Well at least the first two. Thanks for sharing. I love, love, love Katie McGarry and Pushing the Limits and Dare You To are some of my favorite books. But I'm so nervous to read Crash Into You, because I'm expecting a lot. I'm also a little nervous that Rachel might frustrate me a little bit. However, I had the same feelings going into Dare You To, and I loved it. I'm glad that you liked this for the most part, even if you had some issues with it. Thanks for the review! I loved Isaiah from PTL and wanted him to have a HEA soon. So glad that time is here! Even though the book has some weak moments, I'm enjoyed you enjoyed it enough. That's how I felt with Dare You To.